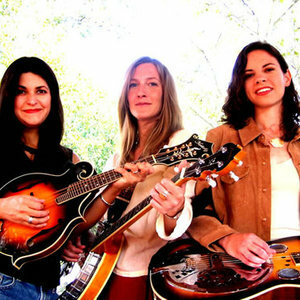 Red Molly is a folk trio consisting of Laurie MacAllister (vocals, guitar, banjo), Abbie Gardner (vocals, guitar, Dobro, lap steel guitar), and Carolann Solebello (vocals, guitar, precision acoustic bass, mandolin). They perform original works composed by each of the group members, as well as covers of other songwriters including Hank Williams, Gillian Welch and Ryan Adams. Their fans are known as Redheads. Red Molly was formed late one night at the 2004 Falcon Ridge Folk Festival. Abbie, Carolann, and Laurie, solo singer/songwriters, were the last ones left at a song circle. They liked the way they sounded together and decided to form a band. There are many theories of where the name comes from but on their website they state that it has nothing to do with the character from the Richard Thompson song 1952 Vincent Black Lightning but was inspired by Emmylou Harris's album Red Dirt Girl. Their career started to take off in 2006. They were the top vote getters in the 2006 Falcon Ridge Folk Festival Emerging Artist Showcase. WUMB in Boston named them Top New Artist of the Year and picked their Album Never Been to Vegas one of their Top 10 Albums of 2006. They appeared in John Platt's Under the Radar series in New York a showcase for up and coming musicians. In 2007 they toured with Pat Wictor and Ellis, the other winners of the Falcon Ridge Emerging Artist showcase, on the Falcon Ridge Preview tour and performed with them in the Most Wanted Song Swap at the Festival itself. In 2010 they have played Merlefest and have been invited back to the Falcon Ridge Folk Festival as a headliner. Their album Love and Other Tragedies reached number 15 on the Americana Charts on June 30, 2008. Their next album James reached #4 on the Americana charts in May of 2010 and # 1 on the Folk DJ chart.